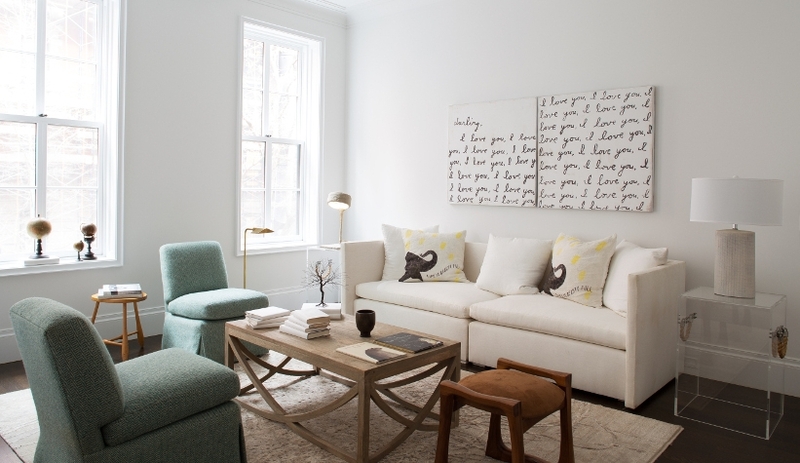 Maison Gerard recently decorated a townhouse on 11th street. The address, a four story space located just off University, and around the corner from the gallery, provided us the perfect opportunity to showcase our inventory in never before seen arrangements, and to feature a host of beautiful items either too large or too distinctive to keep in our space on 10th Street year round. 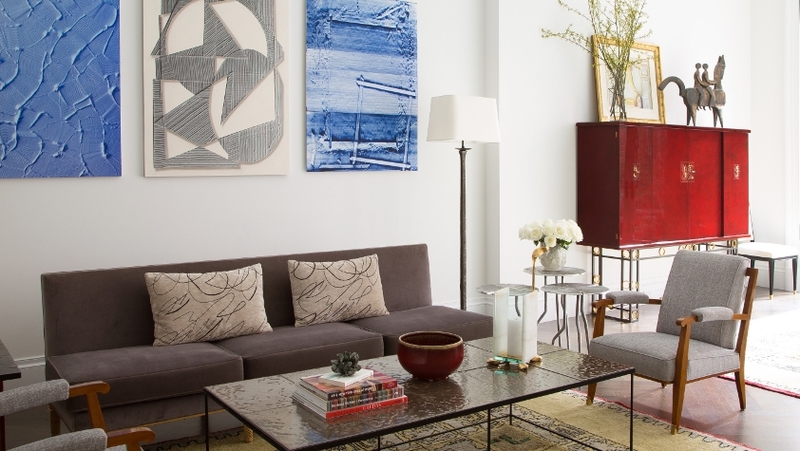 Gallery Principal Benoist Drut and lead decorator Dorothee Mathieux wasted no time in filling the beautiful townhouse, from basement to rooftop patio, with the best Maison Gerard had to offer. 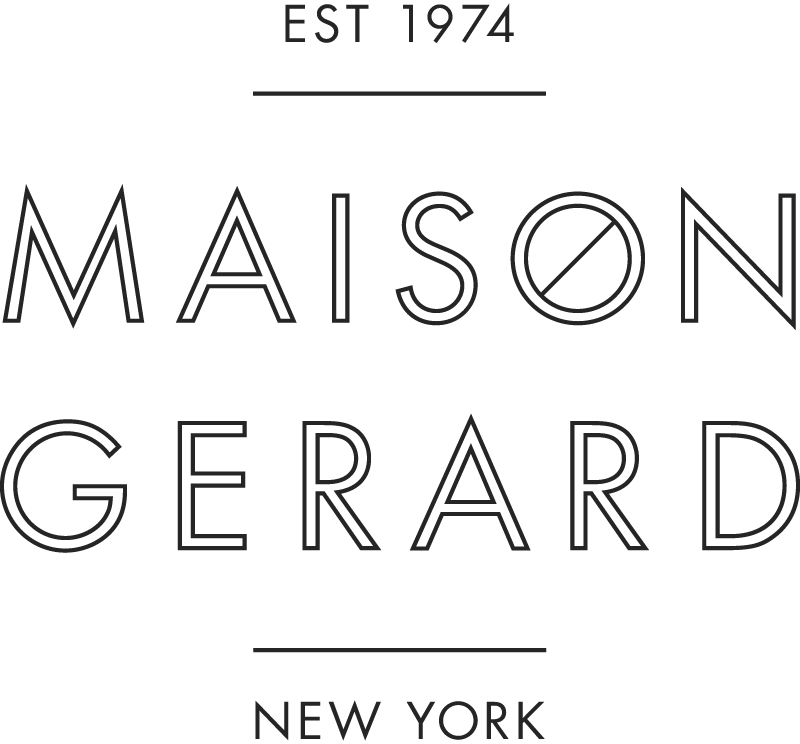 When the dust had settled, Jean Francois Jaussaud, French photographer, art director, and producer, whom Maison Gerard proudly represents (and whose work is featured in the townhouse), stopped by to shoot the finished product. Here are his exquisite photos of a beautiful space well realized. 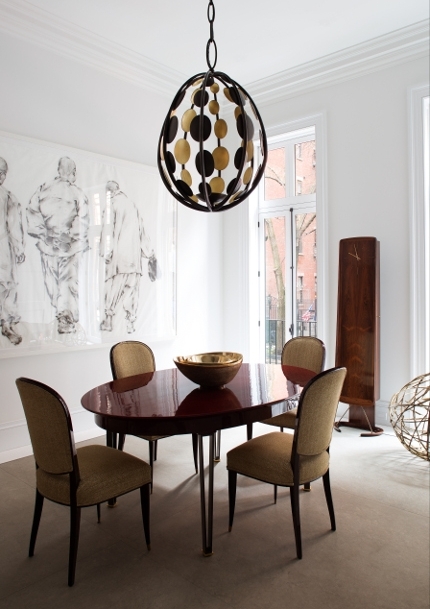 Three of a set of six dining chairs made by Andre Mercier circa 1940; a glass topped, patinated bronze dining table by Fred Brouard; a table top sculpture by English silversmith Kevin Grey; and one of a pair of Maison Leleu carpets from 1957. A pair of Maison Leleu armchairs and a Maison Ramsay sofa, all from the 1950s. A lantern of onyx, gilt bronze, and glass from Aldus and a set of three cast-aluminium nesting tables by Franck Evenou. A pair of Maison Leleu armchairs and a Maison Ramsay sofa, all from the 1950s. One of a pair of lacquer, Maison Leleu cabinets, circa 1957. 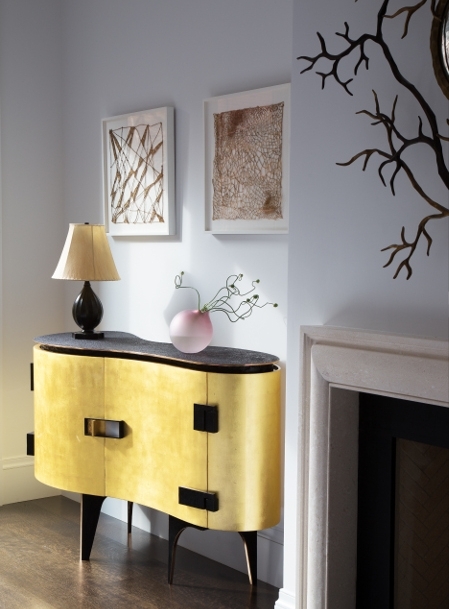 A lantern of onyx, gilt bronze, and glass from Aldus and a set of three cast-aluminium nesting tables by Franck Evenou. A pair of Billy Baldwin slipper chairs upholstered in turquoise tweed, a Nacho Carbonell table lamp, and a set of early 20th century globes from France. 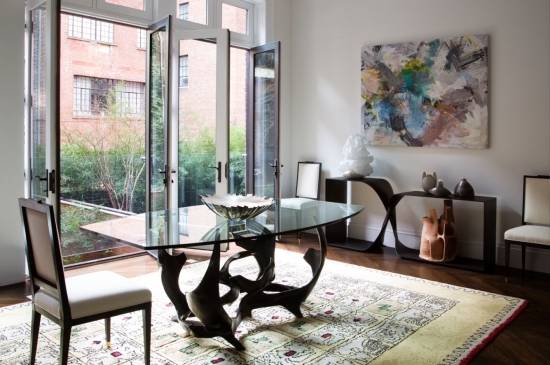 A Guillerme et Chambron living room set, circa 1960; a set of three polished cast bronze vases by Moroccan artist Jaimal Odedra; and a set of three mid century, wrought iron barstools. The Silk cabinet by Achille Salvagni; a pair pieces made of woven reeds, by French artist Marinette Cueco; and one of a pair of lamps by Just Andersen, circa 1930. 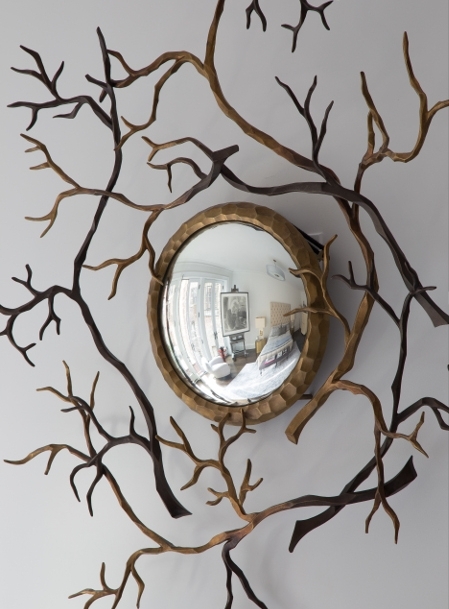 Hervé Van der Straeten’s Branches Bull’s-Evye Mirror, patinated bronze and glass. 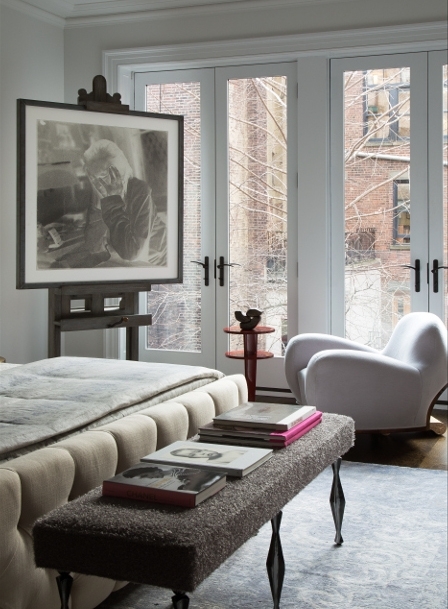 A six legged bench by French designer Marc Bankowski; the Tato armchair by Achille Salvagni; a Maison Leleu two tiered side table in lacquer, circa 1950s; a table top sculpture in bronze by the artist known as Zigor; and a photograph of Louise Bourgeois by Jean-Francois Jaussaud. 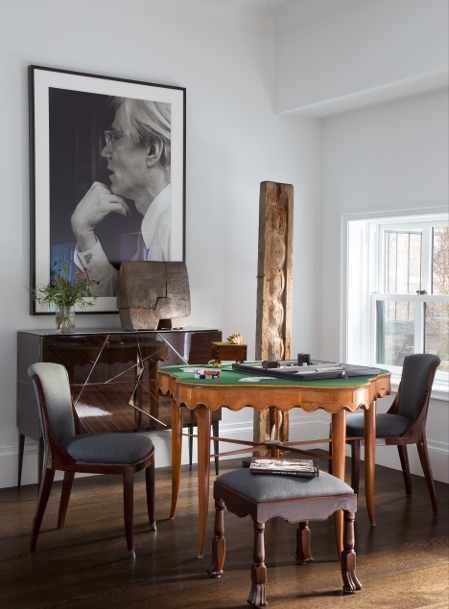 A pair of Maison Leleu sidechairs, circa 1925; a mid-century game table covered in felt; the Gio cabinet by Achille Salvagni; a ceramic sculpture by Erik Astoul; a standing sculpture in wood by Korean artist Yongjin Han. 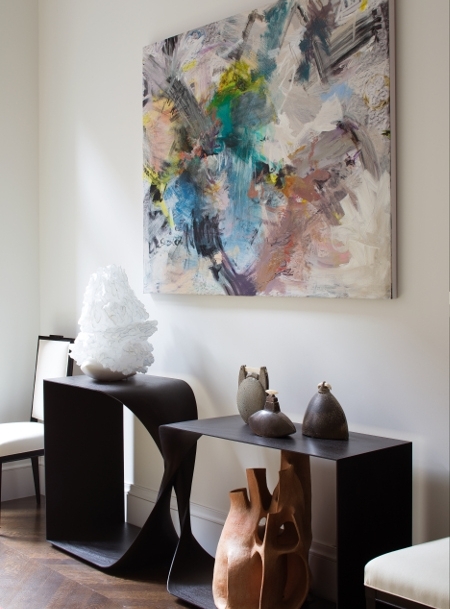 Stool with lamb upholstery by Marc Bankowski and a pair of stone sculptures by Yongjin Han. The Angel mirror from Aldus. 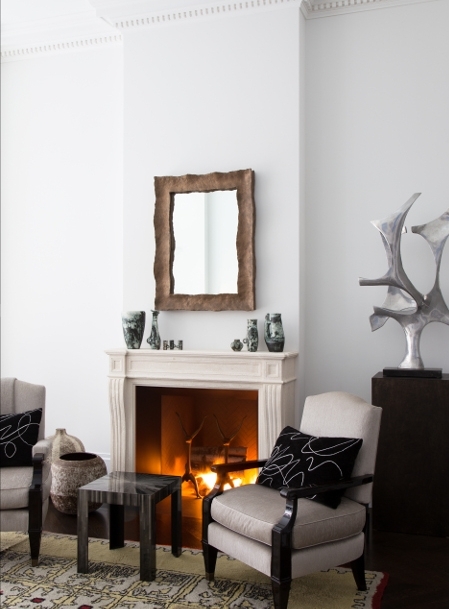 A pair of armchairs by Jean Pascaud; a steel side table by Alexandr Zhikulin; the Hadrian mirror by Bill Sullivan; ceramics by Jacques Blin and Claude Conover; a sculpture by Fred Brouard; and a pair of pillows by Miguel Cisterna. 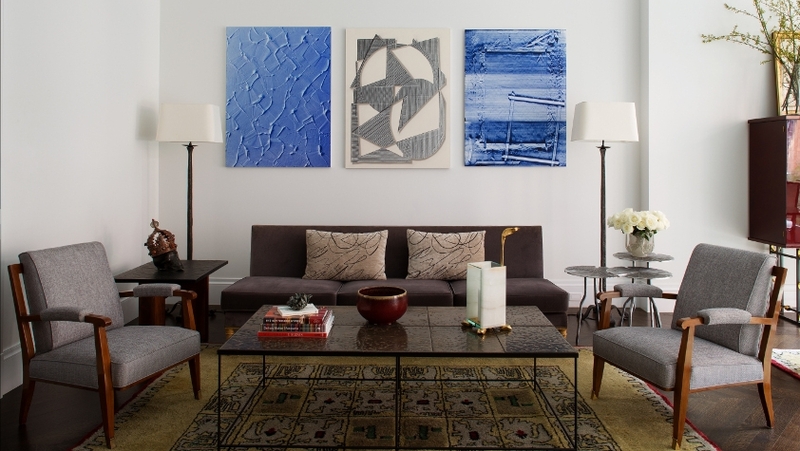 A set of three ceramics with bone lids by Aage Birck; a table lamp by Israeli artist Ayala Serfaty; a an ebonized mahogany console by Carol Egan; and an illuminated ceramic sculpture by Guy Bareff. 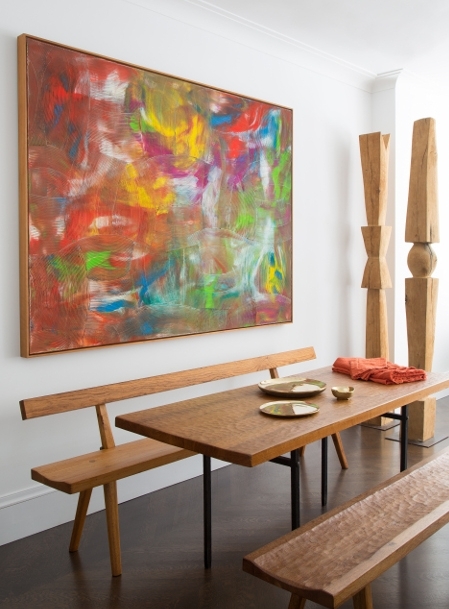 Four of a set of ten Maison Leleu dining chairs; a red lacquer Maison Leleu dining table; the Ellipse handelier by Hervé van der Staeten; a grandfather clock by Arne Hovmand Olsen; and a set of Rupi nesting bowls by Jaimal Odedra.